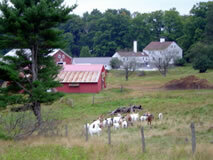 Liz and Jeff Conrad have been raising sheep and goats at Riverslea Farm in Epping NH since 1991. We sell USDA cuts of lamb and goat, washable sheepskins and a variety of wool products to ensure a sustainable farm. Our farm shop is open year-round daily from noon to six. We're closed Wed, Sun and holidays. You'll also find us at the Seacoast Growers markets in Exeter and Portsmouth May - Nov. We're at the Seacoast Eat Local markets Nov thru April. We're proud to supply some of the finest restaurants on the seacoast. No routine antibiotics used, No added hormones, Pasture-raised, Grassfed with grain supplement. Farm shop is open noon to six year-round, closed Wed, Sunday and holidays.